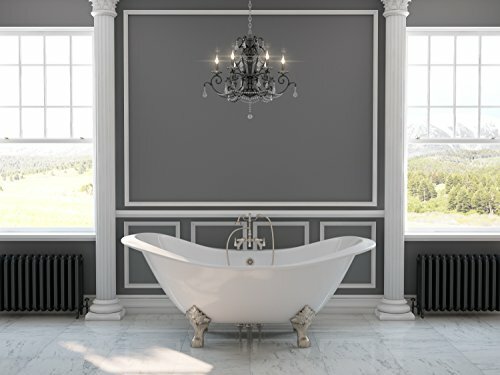 You wouldn’t think your bathtub would influence how the overall room looks, but there’s one type of tub that can make your bathroom look like an elegant 18th-century fixture. We’re talking, of course, about a clawfoot tub: a free-standing tub with ornate furnishings that set it apart from other models. So how do you go about choosing the best clawfoot bathtub? We’ve done some of the work for you by compiling a list of our top five picks, based on online research and clawfoot bathtub reviews. We’ll also tell you about the characteristics you should look for in a bathtub and how to know whether one will work in your bathroom. 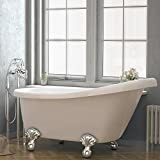 Pelham and White Luxury 60-inch Clawfoot Tub – This clawfoot tub is made of reinforced acrylic and fiberglass, providing it with strength and an elegant look. Most clawfoot tubs only use a single layer of acrylic. 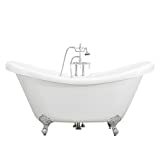 Maykke Gibson 67-inch Traditional Oval Tub – This tub comes with a free-standing faucet/drain assembly included in the price; with many tubs, you have to buy this assembly separately. The Tub Connection Acrylic Faux Copper Tub – If you’re looking for an elegant fixture that looks different from most other tubs, this is the best bet for you. Most tubs are white; this one has a faux-copper finish. It doesn’t come with a drain assembly, though. 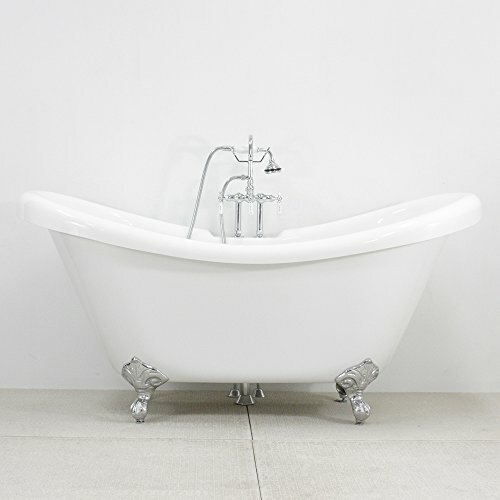 The Tub Connection Cast Iron Double Ended Slipper Tub – Most of the tubs we found are acrylic, but this one is cast iron; better yet, it has a double-ended slipper design and faucet holes for your existing plumbing. Baths of Distinction CoreAcryl Hotel Collection Double Slipper Tub – If you’re worried about the tub getting too hot for you, you needn’t worry. In addition to the standard acrylic layers, this tub has a built-in aluminum heat shield, so you don’t scald or burn yourself. Here we’ll go more in-depth for each product and explain what we liked and didn’t like to give you a better feel for each product and what your options are. 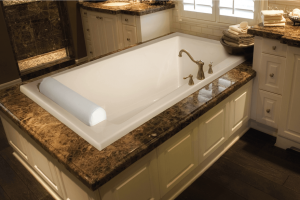 The Pelham and White 60-inch clawfoot tub gives you a medium amount of room to fill the tub with water. 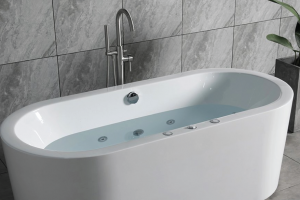 Unlike many recessed tubs, this clawfoot tub has about a 44-gallon capacity. It’s a little less than usual, but we’re willing to make concessions. This bathtub has a classic look that goes well just about anywhere. The melding of acrylic and fiberglass, while not strictly traditional, give an advantage in durability over some other models. It’s far easier to keep it clean, and repair should something happen to cause a scratch. Cast iron tubs, on the other hand, are much harder to keep looking clean. This tub does not have faucet holes. Unless you want to drill them yourself – which we don’t advise because it would ruin the value of the tub – you’ll have to get a free-standing faucet. A free-standing faucet allows a little more freedom in where you can fit the tub, as long as your drain and input lines can reach. As the name suggests, this tub is perfect for a house or bathroom where you’re going for an extra traditional look. It has a chrome-brushed finish on the feet, making them less susceptible to rust and providing a classy, elegant appearance. 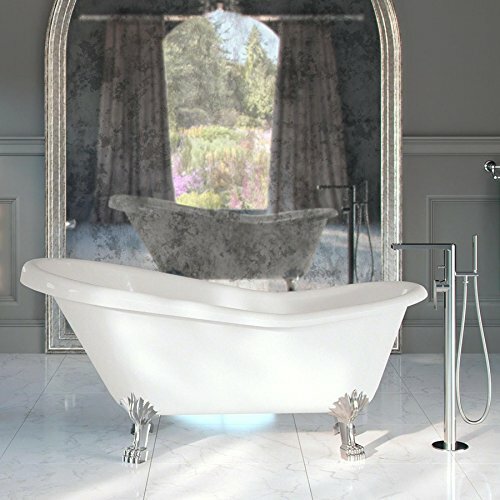 The tub has a single slipper design, so you can easily rest against it while you soak after a long day. Although the tub’s advertisement puts it at 67 inches long, it’s slightly shorter, which throws a few people off their guard. It should still be long enough to stretch out and relax. Unlike the previous tub in our list, this one includes a drain and hose assembly. They are polished with chrome to make them extra water-resistant and good-looking. The main problem we see with this tub is that it has a slightly lower water capacity: only 39 gallons. We’re not sure if that takes the bather into account. 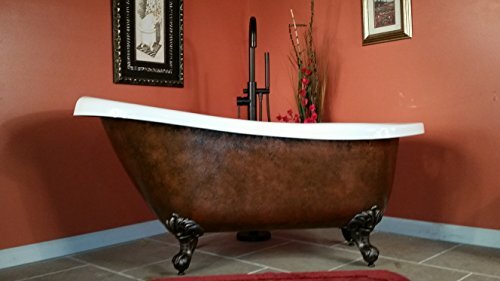 Acrylic 61 Inch Faux Copper Clawfoot Bathtub Without Faucet Holes- "Copper Maries"
This offering from The Tub Connection is well suited to rooms with darker or more rustic decor. The tub, rather than being a pure white finish like many others, is plated in faux copper for a darker, more burnished look. The copper look is only on the outside; the inside is made of acrylic. The claw feet are made of bronze and rubbed with oil to match the outer look of the bathtub. Unfortunately, it has no drillings for a faucet. You’ll have to use a freestanding faucet and attach the drain pipe at the bottom of the tub. This means you’ll need to connect the faucet to your existing plumbing rather than being able to use the lines you already have in place. Depending on where you want to put the bathtub and how much plumbing know-how you have, it may not be feasible. You can expect to pay anywhere from $1,300 to $1,400 for this tub. In our opinion, this is more expensive than we’d like for such a tub. After all, it isn’t made out of copper, nor does it have a lot of special features. If you want a copper look, this is the tub for you. Otherwise, look elsewhere. 71" Cast Iron Double Ended Slipper Tub with 7" Faucet hole Drillings & Brushed Nickel Feet-"Buchanan"
Here’s another offering from The Tub Connection: a cast iron model. Cast iron has different heat retention properties than acrylic: acrylic gets hotter faster, but by the same token loses heat just as quickly. 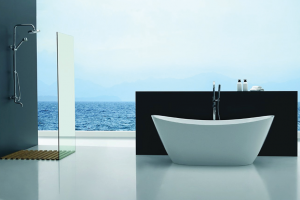 The other feature that stands out about this tub is the double-slippered design and the larger overall profile. You can tell this tub was meant for couples. The double slipper means that two people can sit facing one another in the tub and relax just as easily. If you get your water hot enough, you can also soak for a long time because it won’t lost its heat. The tub has 44 gallons of water capacity, which isn’t bad when you consider it’s meant for two people. This tub, however, does not come with a drain assembly; you’ll have to get that separately. Also, you will need a deck-mounted faucet. In other words, the faucet has to be placed on the tub itself using the holes that are drilled. This acrylic double slipper tub is a smaller variety than the cast-iron one, but it’s only meant for one person, so it’s not a concern. This tub has a brass-finished faucet, drain, and everything needed to install it included in the package, which is an automatic plus in our opinion. You can get the components in a bronze finish if you’re willing to pay an extra fee. The tub itself is made of acrylic but also has an aluminum heat shield. This shield is intended to prevent you from burning yourself or suffering injury. We’ve heard no reports on how well it works, but aluminum is an effective heat-absorbent material. The iron and chrome feet round out the appearance of the tub. Even if you don’t choose one of the tubs we have reviewed, you should still have a basic idea of what you’re looking for. We’ve broken down a few of the properties of clawfoot tubs and how they affect the bathing experience. 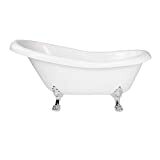 First, determine the dimensions of the tub; a clawfoot bathtub is going to take up more space than an attached one because of the raised body. Measure the space of your bathroom and allow about a foot of clearance around either side for entering and exiting the tub. This includes the height; you need to be able to step into the tub comfortably without straining, and the tallest person in your home should be able to stretch out easily. Next, you need to know whether the tub has holes through which to install your plumbing. Older tubs may not, so you’ll need to purchase a free-standing faucet unit with some drainage pipes. 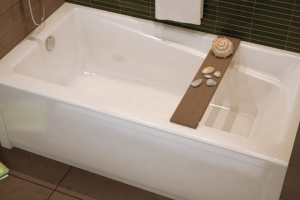 If you can install your existing plumbing into the tub, that makes it easier than having to potentially break through your floor and wall, reroute your water lines, and connect them to a free-standing faucet. A clawfoot bathtub requires you to run water into it almost to the rim because it’s typically intended to soak for prolonged periods. Because of this fact, water can get cold. If you plan to use it for soaking, you need to pick a material that will retain heat. 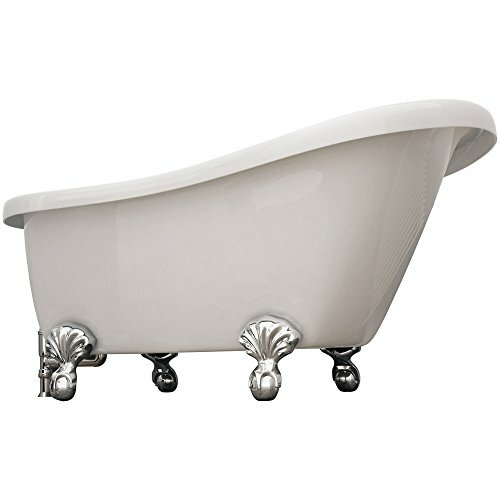 Clawfoot bathtubs come primarily in two materials: acrylic and cast iron. Acrylic, while more modern and easier to repair, doesn’t have the historical appeal that a cast iron tub does. It heats up more quickly than cast iron but also loses heat more quickly. Meanwhile, cast iron tubs take longer to heat but retain their heat for longer; anyone who’s used a cast iron skillet knows how they work with heat. Unfortunately, it’s easier to scratch or damage the coating of a cast iron tub. If the tub will often be used, it’s probably better to seek out an acrylic model. You might be able to find bathtubs made of some odd materials like stone or even wood, but these are more for looks than functionality. If you want to have a tub that holds hot water for you, go with cast iron. You also should consider how much water the tub may need to hold and whether your water heater can handle the task. You only have so much hot water; when it runs out, you need to wait for the heater to refill. This could inconvenience other people in the house. Once you establish your material and whether you don’t mind having a freestanding faucet, you can figure out how you want your tub to be shaped. A rolled rim is a flat design that’s the same height all the way around, and the rolled rim makes you less likely to hurt yourself on sharp edges when you climb into or out of the tub. A slippered design has one end of the tub higher than the other one, making it easy to rest your head against the inside of the tub and relax. Double-slippered models do the same thing, except they have both ends raised. This arrangement works well for couples’ bathtubs. When setting up a clawfoot bathtub, remember that it’s free-standing and likely to end up with water splashing all around it, especially when you get in and out. Make sure your floor is in excellent condition and immediately wipe up stray water. Also, it’s a very heavy fixture. The tub itself could weigh 500 pounds or more. Fill it with water, and that adds 300 more pounds. And, of course, yourself. Make sure the floor can support that weight and isn’t prone to giving out. Clawfoot tubs don’t distribute their weight evenly; instead, it’s focused through the four feet. 250-300 pounds of force over a few square inches is nothing to take lightly. Something else you should consider is the clawed feet themselves Contrary to the name, they don’t have to look like claws. It’s just a convenient way of saying that the tub is raised off the ground and has four separate legs with ornate decorations for feet. Take a look at the claws and decide whether they’re something you want to have in your bathroom. Also, consider the material. Most claws are made of brass with a brushed nickel covering. This helps to prevent rust and other forms of damage from water. 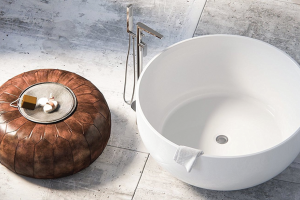 Without the coating, your tub’s claws might develop a green patina from exposure to air and water. We put the Pelham tub at the top of our list for clawfoot tubs. It employs tried-and-true construction and techniques. It’s not a complicated fixture, but then, a clawfoot tub doesn’t need to be. Even though it doesn’t include the faucet, a free-standing faucet can serve just as well. We hope our clawfoot bathtub reviews have helped you decide which tub to get.